NESCAFE Azera Latte: We all love barista style coffee and you can now enjoy your coffee shop favourites in an instant. Smooth and milky, a delicious blend of instant coffee and finely ground roasted coffee beans topped off with a velvety froth. Espresso-based latte sachets for barista-inspired coffee at home. Made with espresso. Single-serve sachets make it easy to prepare a latte in moments. Enjoy mellow coffee flavour and velvety foam in every cup. Quality coffee whenever, wherever and however you want. Create barista-inspired lattes at home with NESCAFÉ AZERA Latte. We made this one for everyone who likes their coffee to have a gentle touch. Made with espresso, you can taste the quality of the smooth, coffee in each cup. Just add hot water and stir for a smooth, milky instant latte. Expertly made with espresso, from a blend of instant and finely ground roasted coffee beans and British cows' milk, our latte is crafted so that you can enjoy the creamy-tasting, barista-inspired lattes you love, whenever, wherever and however you want. Part of our range of espresso-based coffee shop favourites, the NESCAFÉ AZERA Latte is the smoothest and milkiest of the bunch, and perfect if you like a long, mild coffee. 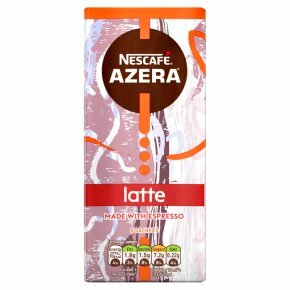 If you're a lover of quality barista-style coffee and want to enjoy the comforting coffee flavour of a great latte at home, NESCAFÉ AZERA latte sachets are for you. And, our coffee is responsibly sourced - so that you can feel great about every cup.